Time for round 3? Ok! In the book, Delsarte studies colors from stained glass windows, colors from India & Biblical tradition, and even Aztec painting, and splits the 3 primary colors into head/heart/body. Yellow was especially surprising to me, since it doesn’t strike me as a smart color. 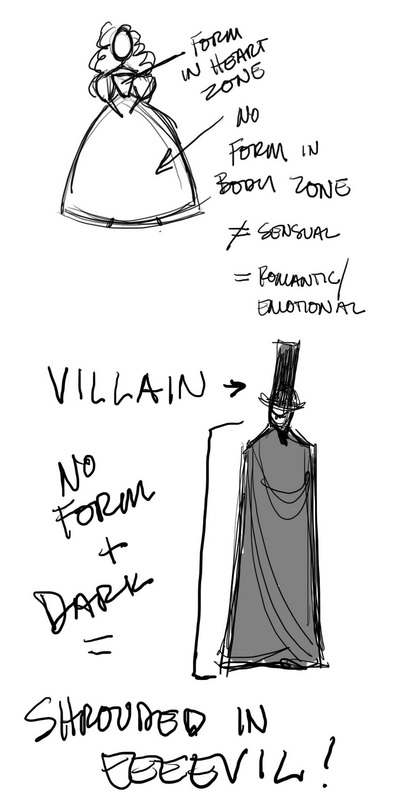 But light bulbs pop up over a character’s head when they get an idea and kings wear yellow crowns, so it makes sense. Briar Rose! Check out the huge contrast in her heart zone. 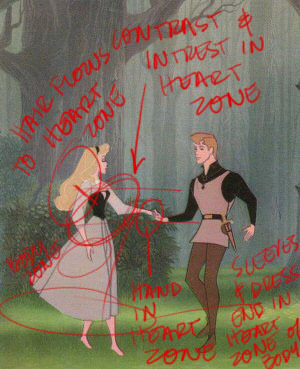 Not only that, but her hair flows to the heart zone, her dress’s hem and sleeves flow to the heart part of her body zone, and one hand is in the heart zone (& her feet are in heart position, I believe.) Totally romantic…which completely matches her character too. Pocahontas. She is in complete body stance–splayed gesture, her hair flows past her heart zone to the body zone, and her hem ends in the body zone too. (She also has a shoulderband you can’t see in the body zone that adds more contrast.) I think the yellow dress and necklace offsets this a little, but she is definitely a vital. 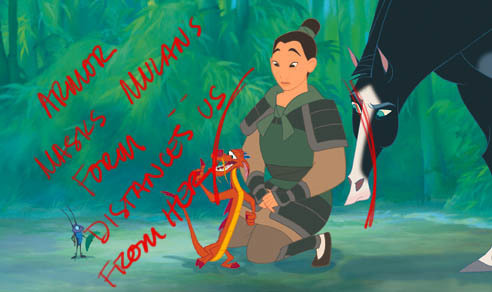 Mulan, because her armor is masking her form. So, in Delsarte world she is less readable and relatable. Which segues into the last Delsarte design stuff this will cover. Which is: the more the form of the character is shown, the more sympathetic, vulnerable, and relatable they will be. 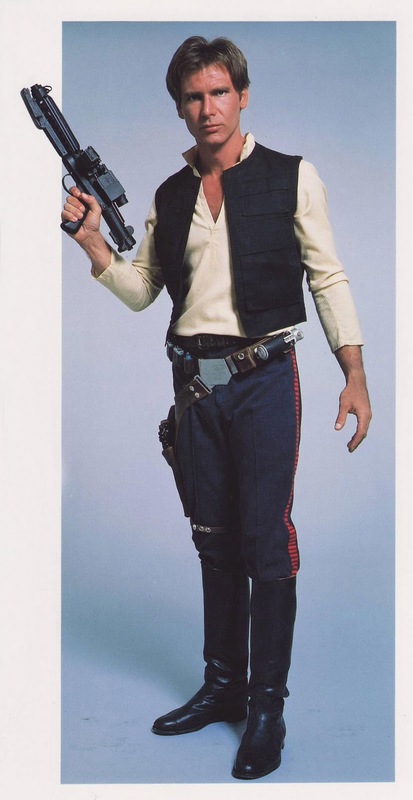 Han Solo has some wicked good Delsarte design. Lots of contrast in his heart zone, and because you can see his form, you can read and empathize with him pretty easily. At the other end of the scale, this picture of Lady Gaga. 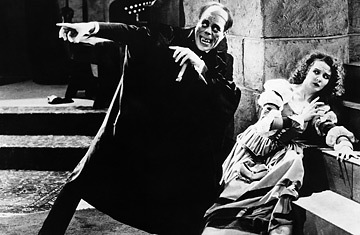 She’s masked her face, form, and head, and so the audience is distanced emotionally from her. 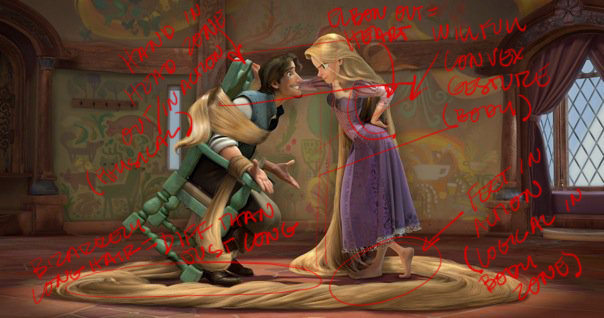 Like a mask, the character’s clothes & shape can alienate the audience from the character. 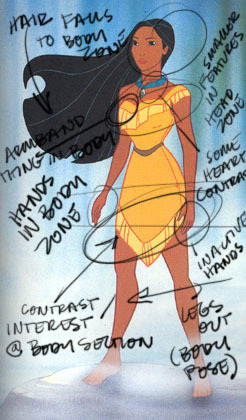 With the Delsarte theory it makes sense why big poofy dresses are considered so romantic–because they distance the person from the body/power zone and focus on the form in the heart zone. To end on a happy note, here’s an excerpt from the book. You brought me this wreath? How it smells of the woods! And Han Solo? Definitely relatable. What an interesting little series! thanks for doing that! Sometimes I feel so daunted byt the masses of information out there, its great when kind souls like you break it down in simple terms and apply it to what we do! Id never have thought about anything in this Delsarte method before but I will start bringing it into my designs more often! "It seems like Delsarte went out of fashion because the system was being used as shortcuts, instead of actual figuring out the character." –Yep, that's what I'M gonna start doing! This is such cool information! Now how do the weeping angels from Doctor Who fit into Delsarte's theories? I liked this blog series quite a lot. 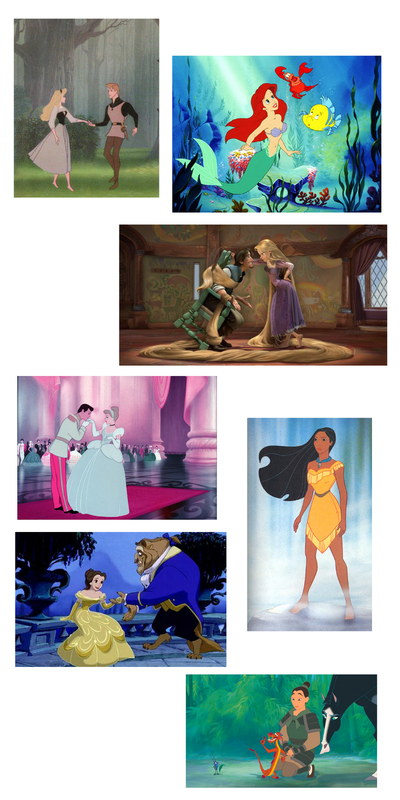 It's very interesting, seems somewhat innate in good character design (though most of us don't recognize WHY it's good design, just that it's good for whatever reason[s]), and it really reminds me of the things I learned in my BYU costume design class (which I do believe is where we met). @Drew – Yes! That's where I learned it too. really interesting stuff. Those were good times. Never would have thought people could read so deeply into such things. Totally cool. just let me tell you that this use of colors is not the Delsarte one, but the one used by Genevieve Stebbins (Stebbins attributed it to Delsarte), and it comes from India. @Franck – Thank you! I can see I have a lot more analysis to do. And thank you for linking to your dissertation! I can't find a lot information on Delsarte but the theory is so fascinating. This will be really interesting. HI Heather. like Franck, I have researched Delsarte a great deal, and I have steered clear of the color analysis with a bit of caution. The Americans did not take the man Delsarte to be a prophet, but more of a social scientist, if such a thing could be said then. Therefore, they were more interested in which of Delsarte's theories could be truly useful, and were willing to adapt them some as anyone should do with science. The use of color struck me as somewhat arbitrary assignments. The movement and body language elements are observable, and have a very clear underpinning of logic, based on the anatomical use and needs of the body parts. The three primary colors strike me as more symbolic than certain, and that all we can know for sure is which colors were assigned by different authors, and cultural ideas of color, not an absolute. I still remain open to possibilities. @Joe – I think you're quite right. 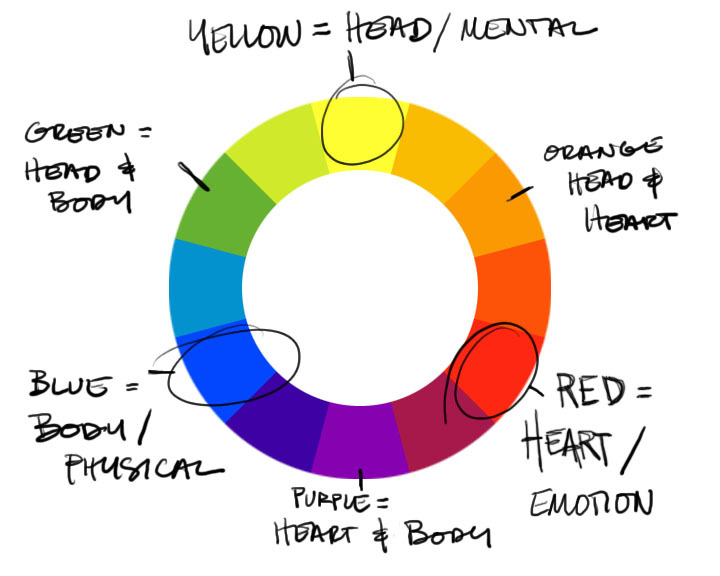 I felt a lot of the information I gathered on the colors was mixed. then you can check if it fits with Delsarte's body symbolism (you can fin it on the chapter 7 of my PhD) (link in my previous message).